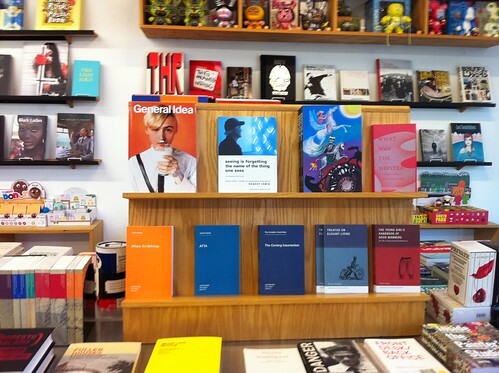 It’s been over a year since I wrote about an independent book store, which may seem like a long lapse for the average person. But I kind of like not leaving my house often. If I’m not taking a cat to the vet, buying groceries or subject to fire evacuations, I pretty much like staying home. And since we moved to the suburbs, driving into Austin seems like Death Race 2000. So even though Domy Books is less than 20 miles from my house, I hadn’t been in three years or so. But Mr Oddbooks urged me to haul my carcass out of the house and off to Domy we went. 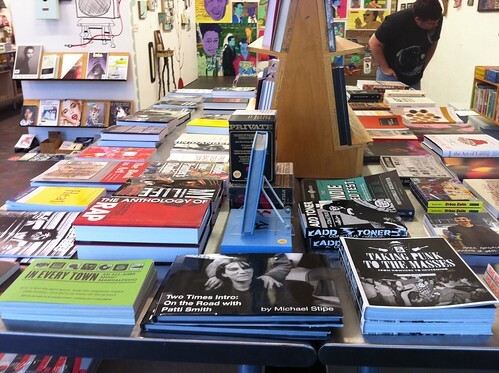 Domy Books is an alternative arts and culture book store and art space. Perhaps it is a good thing I can’t go there much because when I do go, I spend unseemly amounts of money. It’s a visually appealing space. 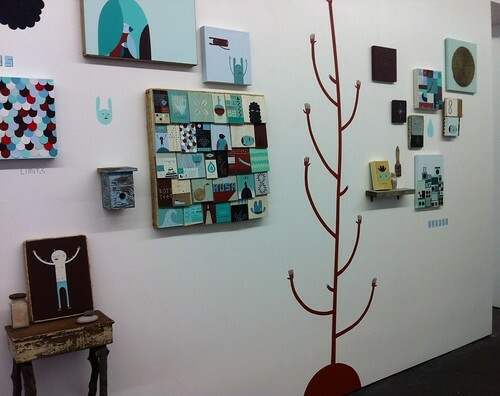 Part of one of the art exhibits on display currently. I don’t know from art, however. I mostly go for the books. It’s one of those spaces where you can never look enough. I feel like I never have enough time to get a handle on all that is on offer there. And I think I don’t look as much as I should because just a quick scan can cost me a couple hundred bucks. A deep look would likely require a bank loan. 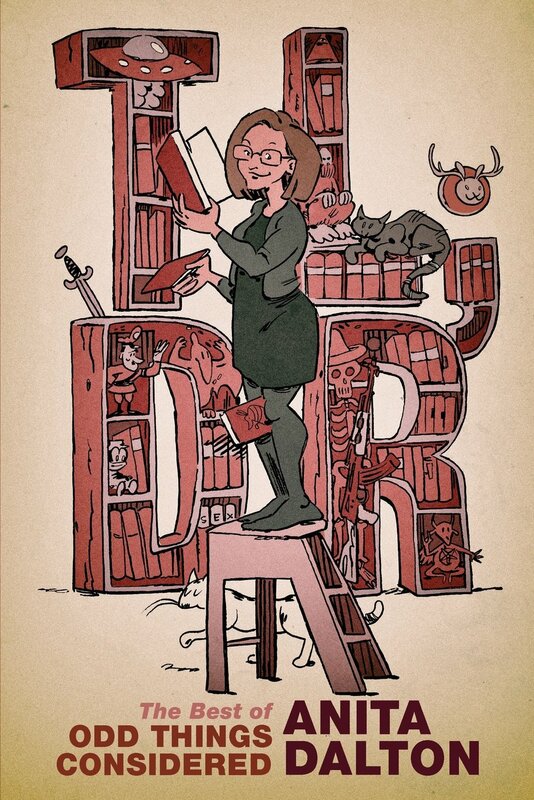 The manager, a friendly and very knowledgeable man named Russell, turned me on to a couple of new strange writers and when I told him I maintained this site, he even offered to do a weird book tour for me if I gave him a heads up so he could organize it. I definitely plan to take him up on this offer once I have gathered sufficient money to take another Domy splurge. I guarantee you there is no way I would have the strength to go on such a tour and not, and forgive the rude parlance, blow my wad. 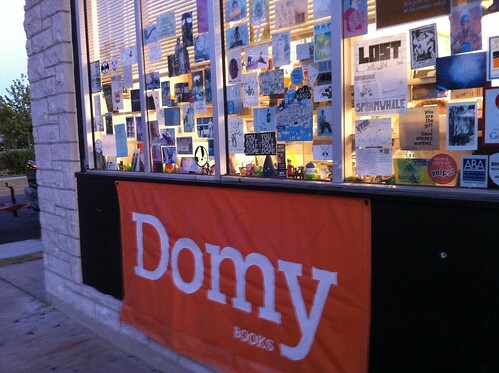 So Austinites, I heartily encourage you to check out Domy. 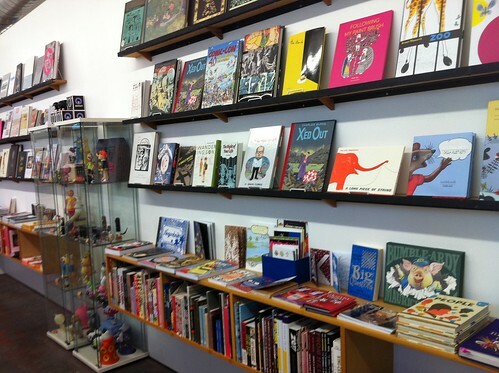 It’s a place to find ‘zines, high and fringe art books, fringe graphic novels, amazing photography compendiums, vinyl collectible dolls, alt culture non-fiction and local art. Russell was laid back and let us look, while offering help or comments when needed. It’s definitely a place where long-term browsing is allowed and encouraged. So visit if you can and if you can’t, you can shop online. I’ve got more pictures of the store on my Flickr account – just click on one of the pics above and wallow in the pretty art and pretty books.